A few inches separate turgid floodwater from everything Mona Houser owns. Some rooms in her trailer already dip below the water, and her family’s scared to flush the toilet for fear of what might come back up. She has no insurance and feels like nobody’s coming to help. “Us poor people, we’re screwed,” she said. The severity of Hurricane Florence’s destruction caught some residents here by surprise, and they said local officials are overwhelmed, too. The storm’s devastating flooding is a sign that coastal states should prepare for future hurricanes to hit harder—and differently—than they have in the past, according to experts who study climate change. For now, few cities or counties have begun adapting to storms that promise to be wetter, from rain and higher seas, because it’s hard to believe such extreme conditions could be common enough to plan for, said Sarah Watson of the Carolinas Integrated Science & Assessments and the South Carolina Sea Grant Consortium. Florence’s rainfall hit especially hard because the region was already saturated by an unusually wet summer. North and South Carolina broke their annual rainfall records, joining Texas and Hawaii to make four new state records in the past year, according to The Washington Post. The Cape Fear River rose yesterday to 63 feet. That’s enough to discharge 33 times its average amount of water, according to preliminary measurements by the U.S. Geological Survey at Lillington, N.C.
More than 72 hours after landfall, people hit by Florence are still desperate for help. The storm has killed at least 32 people and caused billions of dollars in damage. Tens of thousands of residents remained separated from their homes, especially in inland flood zones. Many of the areas underwater also flooded in 2016 during Hurricane Matthew. Some residents wondered why the region wasn’t better prepared for this one. The Cape Fear River has swelled to almost twice the height of its flood stage. Adapting to more frequent conditions like that will be slow, hard work, said Kirstin Dow, a University of South Carolina geographer who researches climate change decisionmaking. Cash-strapped rural communities sometimes need years to address problems. 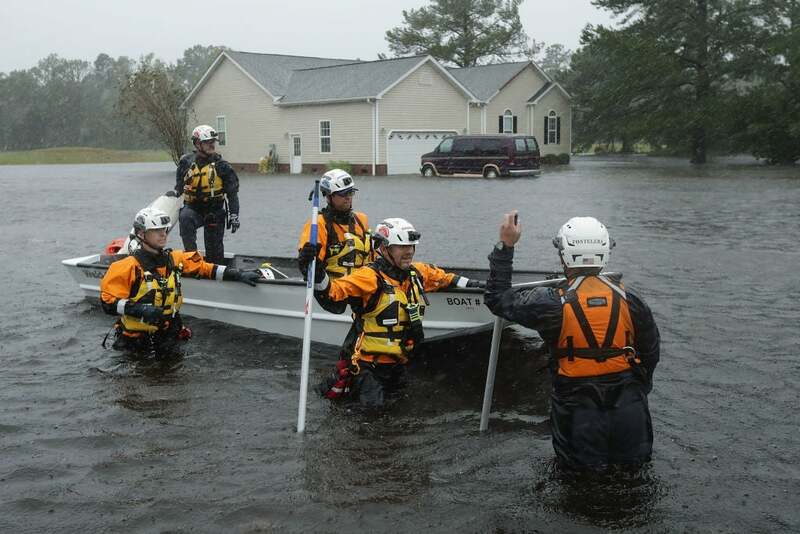 And in North Carolina, much of the state’s adaptation dollars have gone to wealthier cities like Raleigh and Charlotte, said Jessica Whitehead, a hazards adaptation specialist at North Carolina Sea Grant. Still, some residents didn’t have to think very hard about what adaptation would look like. They just pointed at what Florence broke. Laura Davis was angry that buildings constructed in the last decade fared so poorly in the storm. Her future sister-in-law’s new house lost its roof, and it felt like they’d been swindled, she said. “Every home in North Carolina should be covered for hurricanes. And we shouldn’t have to pay for it, because it’s not really our fault,” she said over the sound of a pump sucking out floodwater covering her backyard. Davis’ family moved to the Carolina coast from Virginia’s Tangier Island, one of the most vulnerable places in the country to climate change. Unlike that spot in the Chesapeake Bay, she sees plenty of opportunities to harden her town: drainage areas, more resilient cell towers, buried power lines. The problem is how to pay for those things in rural communities where the tax base is narrow and local government’s footprint is small. “A lot of people are still asking themselves, ‘What does this even look like in a small town in North Carolina?’” said Whitehead, whose program is headquartered at North Carolina State University. The damage from Florence adds up to a bigger problem for Davis’ family: “Our biggest concern is we’re not going to work this week. We’re not going to have money,” she said. Back in Houser’s trailer park, the water pooling around her home didn’t strike her as a mystery. The 53-year-old waved a Newport cigarette as she talked about how melting ice caps are affecting the weather. “I’m just a poor country girl, and I know about the environment,” she said, mentioning that nobody could miss how the beach waters had stayed so warm or how many summer days had cracked 100 degrees Fahrenheit. Even if Florence is a glimpse of the new damage that climate change could cause here, that doesn’t mean people will leave. Many of them don’t have the money to move.